The prime minister has had a dinner-time row with the Argentine foreign minister after he brought up the Falklands over dinner. Hector Timerman raised the issue of the ownership of the islands during a meal-time meeting between EU leaders and Latin American representatives. According to Argentinian media, he said: "The Argentine government expects countries from the European Union to support the United States resolution that urges Argentina and the UK to dialogue over the Malvinas Islands." Mr Cameron demanded to be allowed to respond even though it wasn't his turn to speak, saying "everyone has the right to self-determination". He also argued that it was "totally inappropriate" for Argentina to be "threatening" investors in the area, according to Downing Street. The Argentine ambassador was summoned to the Foreign Office yesterday in a fresh diplomatic row about the Falkland Islands, officials have said. Last week, Argentina's president Cristina Fernandez de Kirchner and ambassador Alicia Castro launched new criticism of the UK Government's plan to boost defences on the islands. It has also been suggested oil firms could be prosecuted if they start work in the waters around the islands without formal permission from Argentina. The UK has no doubt about its sovereignty over the Falkland Islands and surrounding maritime areas, nor about the Falkland Islanders' right to decide their own future. We object strongly to recent statements by the Argentine president and the Argentine ambassador to London and so summoned the ambassador to account for these. Defence Secretary Michael Fallon has told the House of Commons: 'We will always defend the right of the Falkland Islanders'. He said he had approved the "return of military support helicopters" with two Chinooks operational next year to allow "24/7 tactical mobility". "We will be renewing the ground-based air defence system when Rapier comes out of service around the end of the decade. We will also maintain our commitment to provide a Falkland Islands patrol vessel," he added. Britain is expected to increase the defences of the Falklands over fears that Argentina could launch a fresh invasion of the islands. Defence Secretary Michael Fallon said land, sea and air defences were being upgraded in the face of a "very live threat" from the government in Buenos Aires. The move comes amid reports that Russia is working on an agreement to lease 12 long-range bombers to Argentina which could be used to support a renewed attack. Mr Fallon, who is due to set out the Government's plans in a Commons statement later today, said the deal was unconfirmed but that Britain had to take account of any future possible threat. Argentina's FA has been fined 30,000 Swiss francs (£19,444) by Fifa after members of the national team stood with a banner claiming the Falklands as Argentine before a World Cup warm-up match. 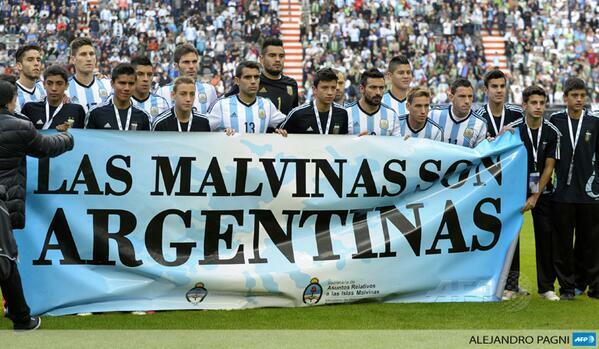 Several players from the team that went on to lose the tournament's final to Germany stood behind the banner reading "Las Malvinas Son Argentinas" ("The Falklands are Argentine") before a friendly win against Slovenia in Buenos Aires on June 7. Russian president Vladimir Putin has urged Britain to "negotiate" the sovereignty of the Falklands Islands with Argentina, accusing the UK of a "double standard in foreign relations." 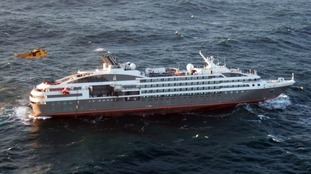 Speaking at an official dinner during a visit to Buenos Aires, Putin said: "Russia supports the need to find a solution in the dispute for the [Falkland] Islands at the negotiation table directly between Great Britain and Argentina. "I wanted to bring attention to the words of Mrs President [Fernandez] regarding the double standard in foreign relations." Argentina president Cristina Fernandez de Kirchner has previously accused Britain of hypocrisy in criticising Crimea's pro-Russian referendum vote yet supporting a pro-British vote in the Falklands. She said: "I appreciate, of course, the support for our national cause [sovereignty of the Falkland Islands] which is not a uniquely Argentine cause." Falklands veterans have protested outside TalkSport calling for pundit Stan Collymore to resign over his Twitter comments about the war. Argentina's football team posed behind a banner declaring "Las Malvinas Son Argentinas (The Malvinas are Argentine)" to the 52,000 crowd before their kick off with Slovenia last night. Fifa take a hard-line approach when dealing with players political views during its large competitions, issuing a fine and a two game ban for South Korea player Jongwoo Park in 2012, after he displayed a political banner during the Olympics. The Falklands banner is apparently put on show before many Argentina games, but the proximity to the World Cup has brought new attention. Argentina's football team stood behind a banner claiming the Falkland Islands belonged to the South American country ahead of a friendly match in Buenos Aires. The team displayed the message apparently in support of the country's claims over the sovereignty of the islands which are a British Overseas Territory. Despite diplomatic clashes over the territory since President Cristina Fernandez de Kirchner took power in Argentina in 2007, islanders voted by 1,513 to three in favour of remaining British in a referendum last year. Prime Minister David Cameron said the result of the ballot "could not have sent a clearer message". Argentina beat Slovenia 2-0, with goals from Lionel Messi and Ricardo Alvarez.